When you buy a Kitemarked flood product you expect it to be flood proof, right? The Kitemark only shows that it won't let in more water than the Kitemark Standard allows. That could be up to half a litre of water per hour per metre. Or it could be a lot less - the knack is to know the seepage rate of the product you are buying before you invest. The DoorShield's seepage rate is tiny (see below for full test results). What difference does the seepage rate mean? Imagine your door is one metre wide. And a flood comes along that lasts two hours. You use a flood barrier with a Kitemark that has 0.5 litre seepage rate. That means it could let in up to A LITRE of water in those two hours. And there might be one on your backdoor too - that's a litre through each door in just a couple of hours. That could spoil quite a bit of nice flooring. And most floods last longer than a couple of hours (some last for weeks). So at this leak rate it can quickly add up to quite a lot of water getting into your home. During that time you may be out of your home and unable to mop up and clear up. Just a few inches of flood water can cause damage that can cost thousands to repair. But with the DoorShield™ the Kitemark testers only saw a few tiny drops of water, even in their longest, toughest tests. And when the testers closely examined the seals after the testing, they couldn't even find a possible source for those drops - so they were likely to have been just a bit of condensation from the very cold water. Here's a table from the longer static water test. The volume of water collected was zero litres at all stages of the test, including the last hour with the maximum depth of water. So the DoorShield is one kitemarked flood product you can rely on to keep flood water out of your home. We're very proud of our test results and our Kitemark. 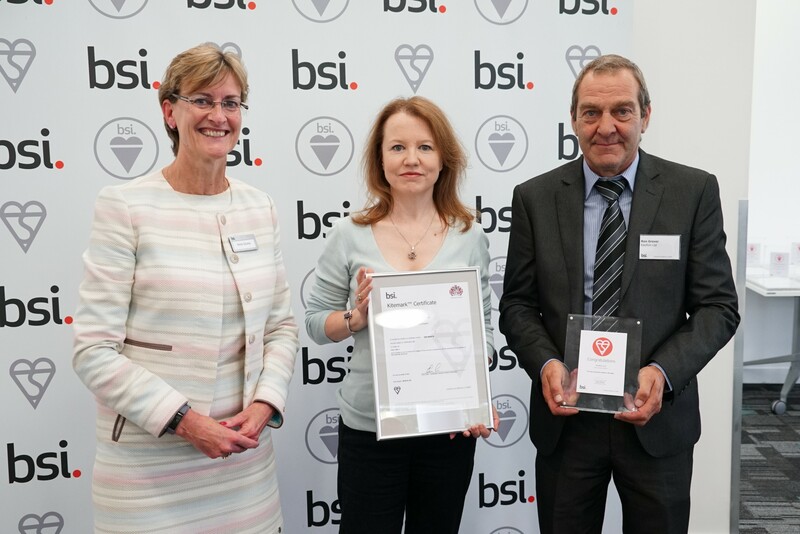 Here's us being awarded the Kitemark at BSI. But the important thing is that you are fully informed when you buy flood products. So we publish our Kitemark test results in full. We think all Kitemarked products should do the same. But if they don't - ask for them. And if they won't release them - well, they're probably not quite as proud of their results as we are of ours.